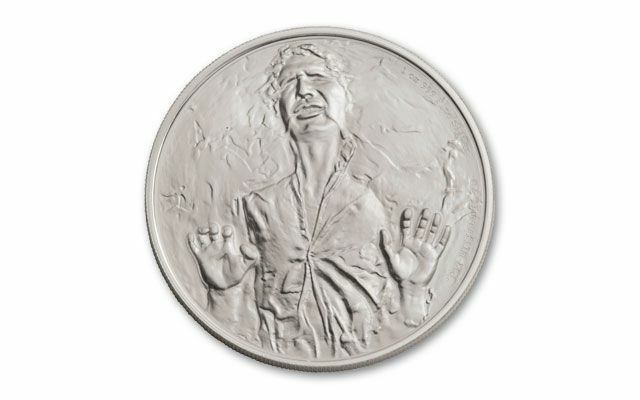 Han Solo Frozen in Pure Silver - Official Star Wars™ Legal Tender Silver Near-Flawless Proofs! Any true Star Wars fan will instantly recognize the image of the unfortunate rogue, Han Solo, frozen in carbonite by the evil Darth Vader in The Empire Strikes Back. That iconic scene represents one of the most famous cliff-hangers in film history. Would Han Solo survive to reappear in the next film, Return of the Jedi, or would he stay frozen in carbonite forever - doomed to remain the ultimate bounty hunter's trophy displayed in the lair of Jabba the Hutt? 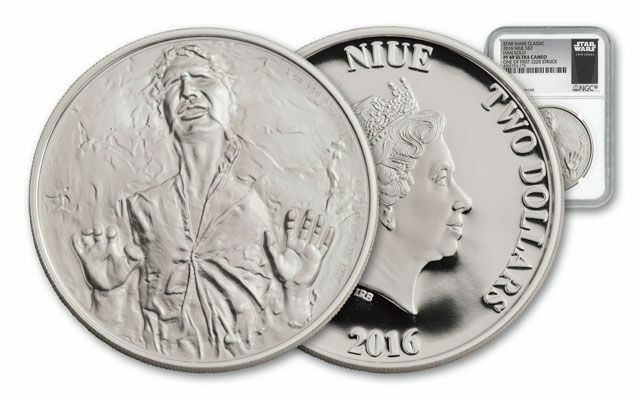 Now, just as an older and wiser Han Solo steps back onto the silver screen in the newest Star Wars movie The Force Awakens, the Pacific island nation of Niue has just released a brand new, officially licensed one-ounce silver proof featuring the image of Han Solo frozen in his carbonite slab. 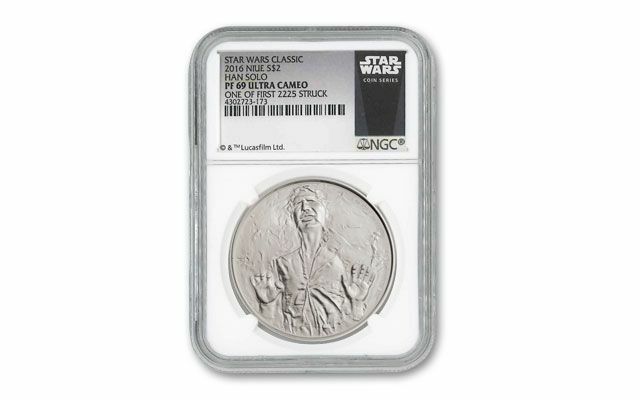 But most any collector will tell you that pure silver beats dirty old carbonite any day! 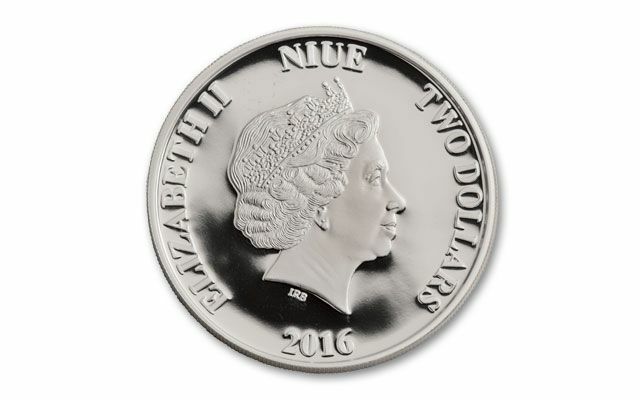 As an official $2 legal-tender coin, it features the royal portrait of her Majesty, Queen Elizabeth II, as well as the 2016 year date and the two dollar denomination. This impressive one-ounce silver proof is minted in 99.9% silver with a mintage of 10,000. It has been professionally graded as Proof-69 Ultra Cameo (PF69UCAM) and certified One of First 2,225 Struck by Numismatic Guaranty Corporation (NGC). Each comes with a numbered certificate of authenticity and the original mint packaging. It never hurts to have the Force with you, but to seize your Han Solo proofs, all you need to do is order now! Please note this product will ship in approximately three days after an order is placed.